One of the most important factors to consider when planning a kitchen is tolerance, you must ensure that you never squash the units up against each other completely. Always leave some room to account for measurement inaccuracies and for utilities such as pipe work and electrical cables, this will ensure easy access to these if necessary. It is especially important to consider tolerance when planning Corner Units. 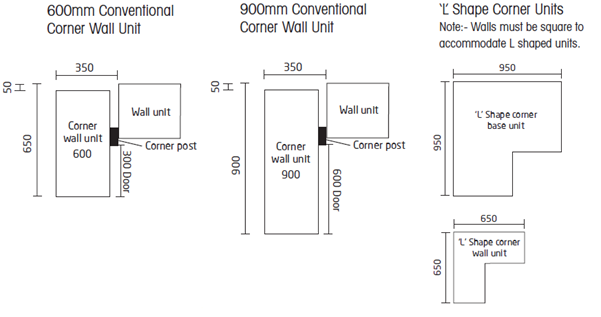 For example if you take the 1000mm Corner Base Unit with a 500mm Door, firstly the unit needs to be 100mm off the wall to bring the door level with the unit that is going to be against it, and then you will need a further 50mm to put in the provided Corner Post which will ensure that the doors on both of the units can be opened without clashing.